RASUWA, Feb 12: With an objective to curb poaching of rare and endangered wildlife, a four-month campaign dedicated to anti-poaching is being launched in Langtang National Park starting from Tuesday. 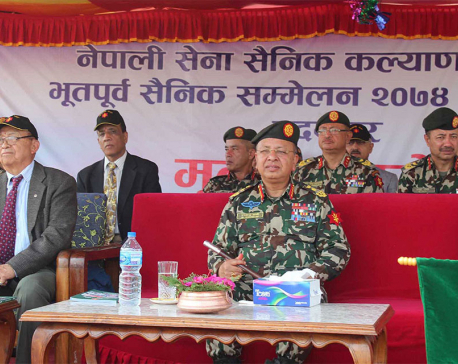 Nepal Army is launching 'Operation Mahahunt', the fourth operation of its kind, on February 13 coinciding with the Army Day. According to the national park, most of the illegal hunting and poaching takes place during winter. As a result, the operation is being launched during winter and would end with the onset of monsoon in June. The national park informed that Nepal Army personnel would be deployed in sensitive areas that are highly vulnerable to poaching. The park spreads across three districts and currently has 1,100 NA personnel for security of wildlife. An additional 250 NA personnel would be deployed for the operation, the park officials informed. “The team would carry out the operation in coordination with the national park employees, local communities, concerned stakeholders and agencies involved in wildlife conservation,” informed Yuwaraj Regmi, chief conservation officer of the park. According to him, NA would patrol the areas and perform various activities to deter poachers, such as camping operation, inspection and other activities. NA has nine posts in the national park covering areas across Rasuwa, Nuwakot and Sindhupalchowk districts while the national park has ten posts. The national park is the habitat of various endangered animals such as red panda, snow leopard, tigers among others. The park has over 100 species of flora, over 46 species of fauna and around 312 species of birds.